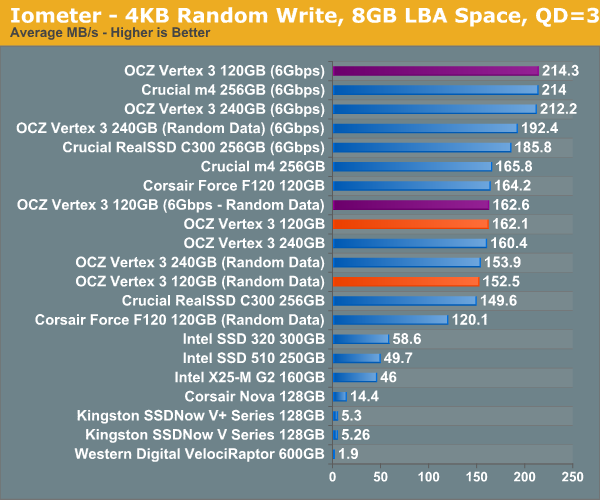 Peak performance on the 120GB Vertex 3 is just as impressive as the 240GB pre-production sample as well as the m4 we just tested. Write incompressible data and you'll see the downside to having fewer active die, the 120GB drive now delivers 84% of the performance of the 240GB drive. In 3Gbps mode the 240 and 120GB drives are identical. At high queue depths the gap between the 120 and 240GB Vertex 3s grows a little bit when we're looking at incompressible data. 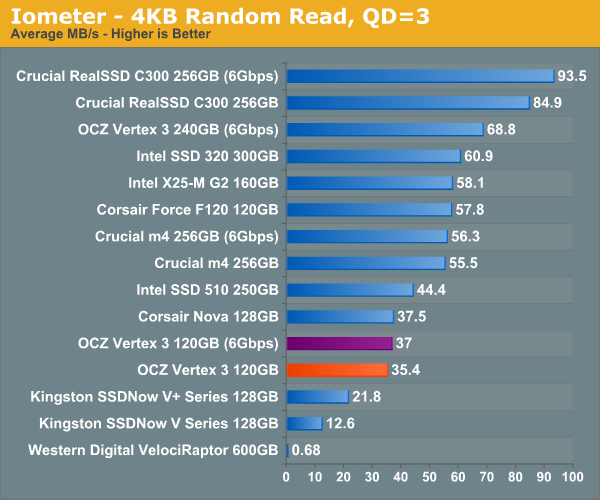 Random read performance is what suffered the most with the transition from 240GB to 120GB. 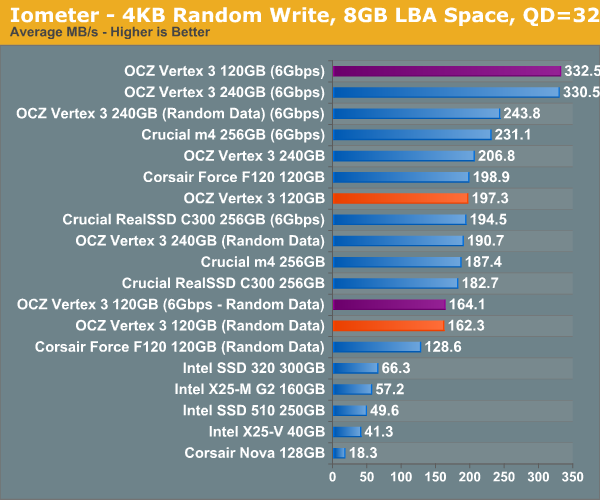 The 120GB Vertex 3 is slower than the 120GB Corsair Force F120 (SF-1200, similar to the Vertex 2) in our random read test. 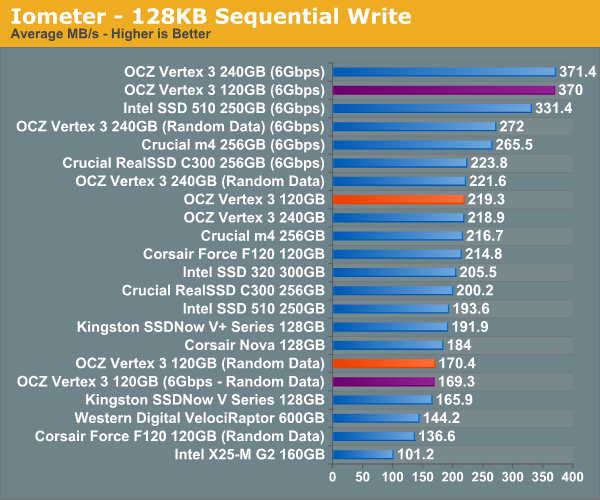 The Vertex 3 is actually about the same speed as the old Indilinx based Nova V128 here. I'm curious to see how this plays out in our real world tests. Highly compressible sequential write speed is identical to the 240GB drive, but use incompressible data and the picture changes dramatically. The 120GB has far fewer NAND die to write to in parallel and in this case manages 76% of the performance of the 240GB drive. 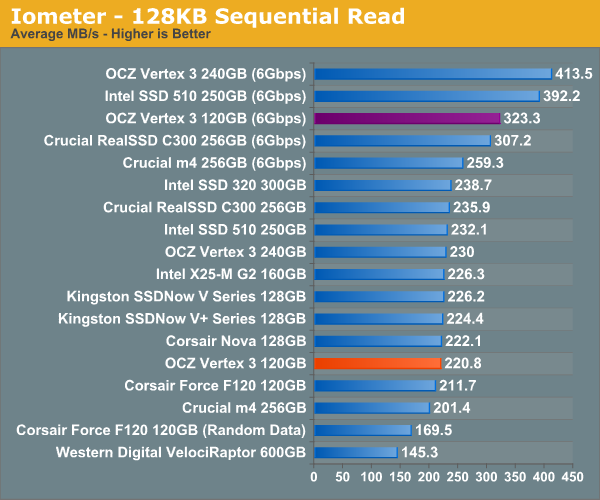 Sequential read speed is also lower than the 240GB drive. Compared to the SF-1200 drives there's still a big improvement as long as you've got a 6Gbps controller. What more can I say? I've been chomping at the bit over this issue ever since SR broke the story. As a loong time Ocz customer (ok...fanboy..lol) I couldn't believe Ocz was behaving like that. The max speed rating using the fastest test available is excusable...like you said, if Ozc would have went the altruistic route then the competition would have take full advantage in about 1 millisecond. After finding out about the inevitable switch to 25nm I quickly ordered another drive for my existing array from a lesser known vendor that I hoped was still selling older stock. I received the drive and to my dismay it was a 25nm/64Gb piece. Adding this drive to my existing array of 34nm/32Gb drives would have a definite negative effect. Which brings me to my point. "After a dose of public retribution OCZ agreed to allow end users to swap 25nm Vertex 2s for 34nm drives, they would simply have to pay the difference in cost. OCZ realized that was yet another mistake and eventually allowed the swap for free." Please include Vertex 2 120GB, as it is probably one of the most popular drives out there.